I laugh as I toss my overnight bag onto my bed in the guesthouse where we are staying as guests of Waterbrook Estates. Cybele and my dad had been married for just under a year when my husband, Kurt, and I traveled to Walla Walla along with my brother, John, and his wife Jamie. 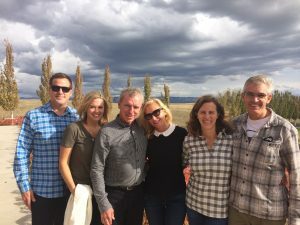 The trip was my brother John’s idea; he had been raving about Walla Walla’s wines, and the relaxed, cool vibe that he had discovered in some of the tasting rooms. I’m not much of a wine connoisseur, but jumped at the chance to spend time with my family. True to form, we’re not in the guesthouse for five minutes before John and Dad have opened a bottle of chilled Chardonnay and are sparring about the flavors. Dad demands butter in his Chard, and John is more of a crisp-with-a-bit-of-pucker Chard kind of guy. The rest of us join in a toast and then walk the gravel road, wine glasses in hand, to where grapes are being delivered in giant troughs driven by semi trucks to the winemaking facility behind the house and tasting room. One truck comes in, sending gravel dust into the quickly cooling evening air, and I realize that he’s in a hurry. Moments later, the truck’s trough starts tipping sideways and a gush of purple-black liquid followed by the fruit starts to pour into a giant metal basin. I have to stand back or get sprayed by the juice. All around us are tall, stainless steel silos, concrete floors, metal tubs on wheels, some empty, some half full of grapes, and everything is stained with red juice. Bits of grape mash blot the walkways, stairway, and floors. This is the height of the crush, and it’s “go” time. Nobody rests until all the grapes are safely off the vines. We leave the mess and chaos of the delivery area for a tour of the warehouse with Waterbrook’s head winemaker, John Freeman. Rows and rows of barrels greet us, stacked from the floor to the high ceiling. We taste wine in many different stages of fermenting. Halfway through the tour we actually dip our wine glasses into a vat of berries picked just two days ago and siphon out a tablespoon of juice, and I can just taste the beginning of the fermentation that will make this wine great. The warehouse is like a hive, and the worker bees wear Carharts and thick work-wear jackets, trucker hats, and rubber boots. They carry odd-looking tools that resemble giant squeegees and rakes, and drive forklifts at frightening speeds. Freeman leads us to his office, and offers us bottles of Miller from his mini-fridge. “Winemaking is tough work,” Freeman says, sharing a toast with my brother and Kurt. “Beer is the best palate cleanser there is.” When we leave him for dinner in town, I overhear him say to John that he’ll likely stay at the facility, moving grapes around, until midnight. The final stop on our tour the following day is a much smaller operation run by mastermind Justin Wiley. He founded Va Piano, which means, “go slowly,” with the intention of making small batches of great wine. He’s promised us a tour and special tasting if we bring him lunch. We show up with our to-go bags but drop them in the adjoining upstairs guesthouse to catch up with Wiley. The tasting area is buzzing with customers purchasing everything from taster flights to bottles of wine to merchandise like hats and water bottles. It seems everybody wants a piece of this place. 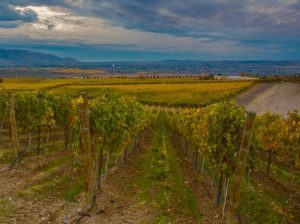 The day is wet and stormy, with winds whipping through the acres of green vines draped over their trellises, and the customers are appropriately dressed in wool sweaters, jeans, and puffy coats. Wiley leads us to his small production space behind the tasting area and through the verse, chorus, verse of how grapes are turned into wine. By now, we’ve heard the song enough times to know the words and eagerly follow along. 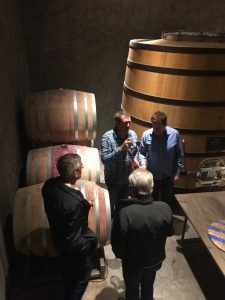 When we sample some of the wines Wylie is crafting in the cellar, I quickly see why they are so in demand: each barrel offers something unique and is packed with flavor: blackberry, caramel, toasted oak. At lunch, Wiley shares a Pyrex measuring cup of a special treat: his ready-for-bottling Sauvignon Blanc. We savor it with sandwiches and Kettle chips. It’s somehow a perfect combination on this stormy, steamy day. Apparently the grapes that make it grow over an ancient cobblestone riverbed that moderates the soil temperature and contributes to the terroir’s complexity. The result is a soft profile, with a subtle crispness. Our group drains the Pyrex, and Wylie’s Italian intern, Luca, goes back for more. “This place is going to take off. It’s just in its infancy now,” John says as we head for the car, and it’s true. Most winemakers have only been producing for less than twenty years, some less than two. 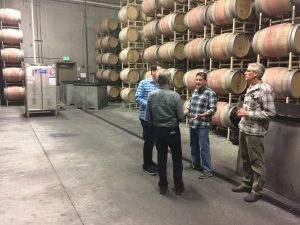 I feel like our group was treated to what will someday be known as “the good old days”—tours that include tasting a vat of fresh fermented grapes, or sharing a casual lunch with wine delivered via Pyrex. So as we drive away, with bad 80s rap thumping us down the muddy road, I savor the view and the memories made with my favorite people, and make a pact to return before then.